I am in shock that I have managed to live my life so far without knowing how incredibly simple and easy it is to make chocolate. And not just any old chocolate the real deal, top notch stuff. Naturally gluten-free it’s also refined sugar free, vegan with no dairy or eggs. Just, pure chocolate. Packed full of antioxidants, some of which are anti-inflammatory it also contains phenylethylamine, and can produce serotonin and dopamine which stimulate happiness, pleasure and mental alertness. But before you rush down to your nearest shop to stock up on chocolate bars, not all chocolate is equal. Only chocolate made from cacao butter and powder has these amazing qualities. Regular mass produced chocolate uses cocoa created by roasting the coco beans and in the process loosing its super powers, it’s also packed full of refined sugar, trans fats, preservatives and weird collection of additives and chemicals. But never fear making your own chocolate is as easy as 1, 2, 3 (see below) and raw cacao is now easier to get than ever from health food shops, some big supermarkets and even that massive online retailer. As this chocolate isn’t packed full of refined sugar and other nasties you’ll find you wont get the same blood sugar spike and induced cravings for more. A little goes a long way which is a great thing, as although it has lots of health benefits it still contains sugar, which evenun-refined is not good for our over all health if we eat too much. This chocolate freezes well so I make up a huge batch and freeze some for a rainy day/ any excuse to eat it. I’ve found that any form of 70% chocolate has been rejected by my usual chocolate adoring children but this recipe has been a major hit and is not all bitter tasting. It’s also a really easy recipe for kids to enjoy making, adding their own ingredients and enjoy the cooks reward of licking the spoon in the bowl afterwards. 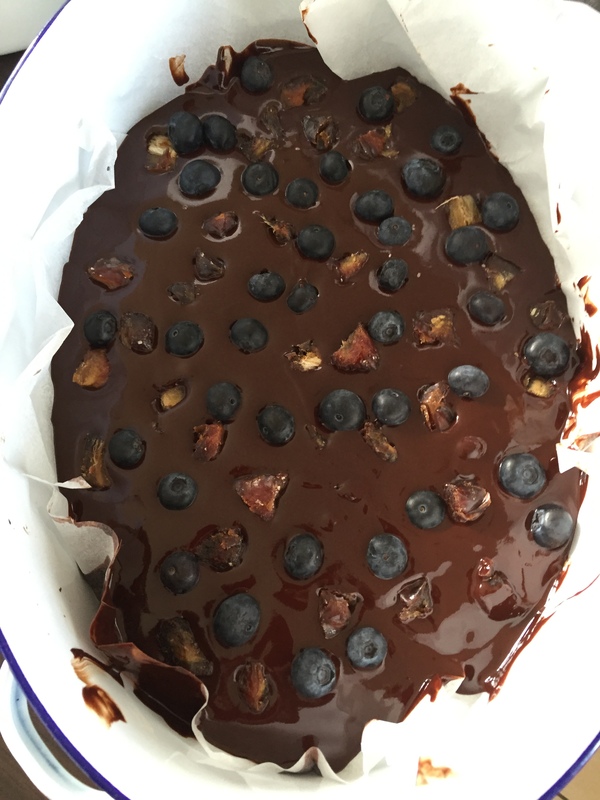 I made this recipe with blueberries and medjool dates, which makes this lovely creamy tasting luxurious chocolate full of delicious goodness. 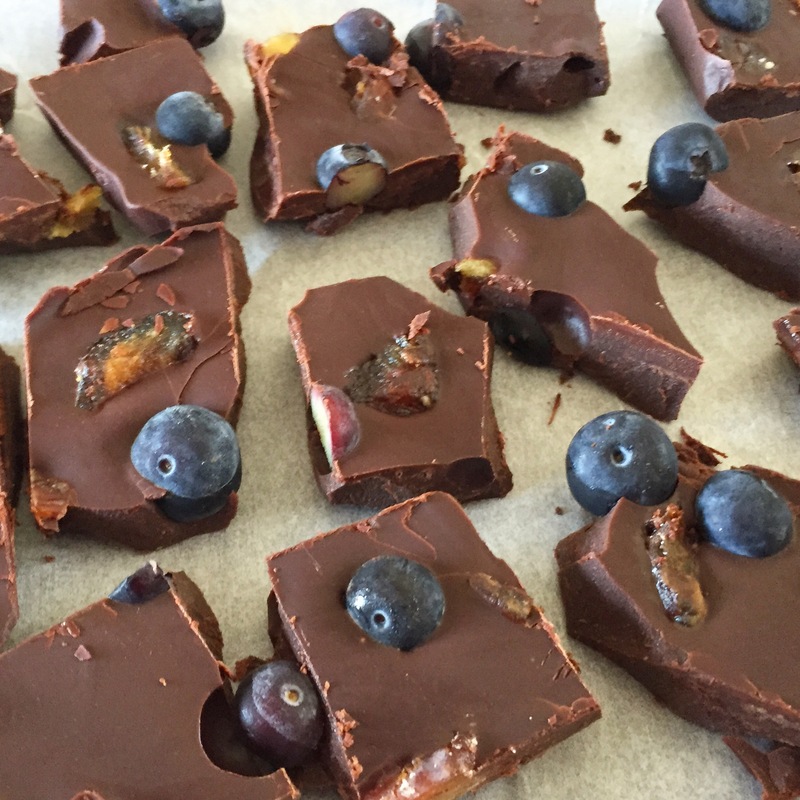 This recipe is great to easily pimp it up with any ingredients, nuts, fruit, seeds anything you like and of course add almond, coconut or cows milk to make milk chocolate and more of it. Just add a little at a time, tasting it until you have your perfect concoction. There’s a little bit of Willy Wonka in all of us. Enjoy! A luxurious, rich pure chocolate naturally gluten, grain and dairy free. Gently melt the cacao butter and coconut oil in a bowl, placed in a pan of simmering water, making sure the bowl doesn’t touch the water. 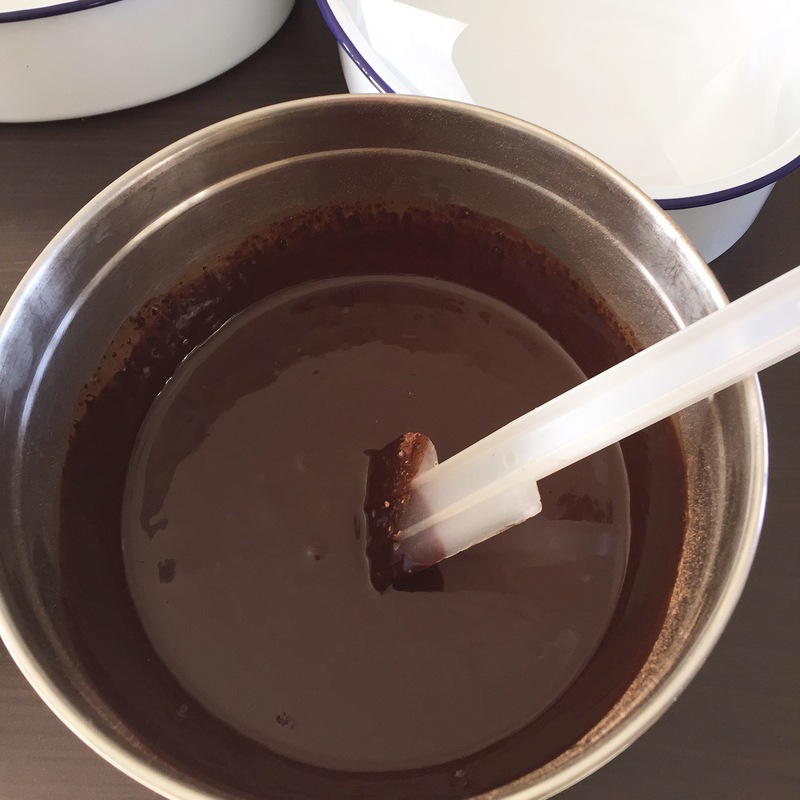 When melted gently stir in the cacao powder, honey and maple syrup using a spatular until you have an even thick chocolate consistency and add the salt. Pour into a large baking dish lined with baking paper, sprinkle with the blueberries and medjool date pieces and place in the freezer for 2 hours. Take out of the freezer and Enjoy! Notes: This chocolate will last for up to 3 days and is best kept covered or wrapped in foil or baking paper, for best results over long periods of time store in a fridge. It will also freeze covered for up to one month. I couldn’t possibly say!! ha! ha! It really, really is Catherine. Oh boy. This is definitely going on my recipe list. I can’t wait to try it! Thank you. I hope you love it as much as everyone else whose tried it so far. Oh I am going to try this, looks devine. Thank you. Without wanting to be big headed it is! Thanks Elaine it’s my best creation so far. Thanks Victoria it’s really delicious. I’m soooo making this. Looks amazing!